Performers include: Bob Harper, Jillian Michaels, Alison Sweeney, Kelly Fields, Mark Kruger, Roger Shultz, J.D. Roth, Hollie Self, Jay Kruger, Kim Lyons, Vicky Vilcan, Caroline Rhea, Dan Evans, Heba Salama, Brittany Aberle, Maggie King, Renee Wilson, Amy Cremen, Bernardo Salazar, Michelle Augilar, Paul Marks, Coleen Skeaback, Phillip Parham, Trent Patterson, Brady Vilcan, Alison Vincent, Jackie Evans, Amy Parham, Shellay Cremen, Jennifer Widder, and Bette Sue Burkland. A reality show in which overweight contestants slim down and compete to win $250,000. Competitors are housed on a ranch, split into two teams, and are assigned a fitness trainer. Each week, the team that loses the least amount of weight must vote one of their members out of the competition. In later weeks, contestants compete as individuals. Each episode features a temptation of some kind, a reward challenge, the weigh-in and the elimination vote. Creator/executive director J.D. Roth has narrated and actresses Caroline Rhea and Alison Sweeney have hosted. The 16 contestants from this season return for a special reunion and a chance to weigh in one last time and show America how much weight they’ve lost since beginning their weight-loss journeys. Those who have been eliminated will compete for the $100,000 “at home” prize. Then it’s the moment viewers have been waiting for, when one of the three finalists is named this season’s “Biggest Loser” and win the coveted grand prize of $250,000. First aired: February 22, 2016. What do you think? 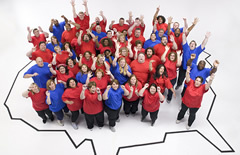 Do you like The Biggest Loser TV show? Do you think it should have been cancelled or renewed for an 18th season? Losing It with Jillian: NBC Reality Series; Cancel or Keep It? Round One: What Top TV Show Should Be Cancelled? Best show going. I don’t miss it. If i can’t be home to watch it, i record it. This show has helped millions of people…If NBC ever cancels this show I will boycot NBC. Too many shows have been canceled that are worth watching. BL is the best reality show. BL gives us a hope and a realization to what needs to be and can be done about this countries obeseity problem.